New London owed much of its early prosperity to the success of its whaling fleet: it was once the third-largest whaling port in the world—ranking only behind the Massachusetts coastal towns of New Bedford and Nantucket. In 1850 alone, over one million dollars of whale oil and bone passed through New London. What has gone largely unrecognized, however, is that, beginning in the early 19th century, much of New London’s whaling activity actually consisted of capturing and processing seals. Whalers refined seal blubber into oil in much the same way they did with that of whales. Settlers in the Northeastern colonies of North America began whaling as early as the 1600s. They initially preyed primarily upon right whales and humpbacks. By the 1700s, however, New Englanders focused their efforts on obtaining the large quantities of valuable spermaceti oil found in sperm whales. The first record of a whaling voyage leaving from New London occurred on May 20, 1784, when a Captain Squire set out to hunt whales aboard the sloop Rising Sun. In 1805, a group of local citizens purchased the ship Dauphin and organized the first New London whaling ship operated by commercial agents. When the overhunting of whales resulted in greatly decreased populations, many whalers began supplementing their incomes by hunting seals. Commercial exploitation of walruses, harp seals, and hooded seals produced significant quantities of oil and leather until the 1930s. The development of steamships, spotter planes, and other technological advances soon decimated worldwide seal populations and led to regulations that limited the number of animals available for commercial use. In addition to dwindling seal populations, a number of factors contributed to the demise of sealing in New England. In the late 19th century, the burgeoning petroleum and gas industry lessened the need for oil made from blubber. In addition, the demand for marine mammal pelts shrank thanks to the rise of the textile industry in New England. Finally, changing attitudes about animal rights—which carried into the 20th century—fostered the growth of seal skin boycotts and other forms of protest against sealing. While the industry still survives in some parts of the world today, the last whaling voyage out of New London commenced on September 24, 1908. On board the Margaret, Captain James W. Buddington set sail for the once prodigious hunting grounds of the North Atlantic. Buddington was an experienced hunter, having served as master aboard the Lizzie P. Simpson on a voyage said to have produced over 86,000 seal skins. One of the last holdouts of local men working in the industry, his return to port on April 14, 1909, marked an end to large-scale whaling and sealing in New London. “New London County Historical Society,” 2016. Link. “American Offshore Whaling Voyages - Database.” National Maritime Digital Library, 2016. Link. “Finding Aid to the Whaling Logs Collection.” Yale University Library, Manuscripts and Archives, Sterling Memorial Library, 2014. Link. Colby, Barnard L. For Oil and Buggy Whips: Whaling Captains of New London County, Connecticut. Mystic, CT: Mystic Seaport Museum, 1990. Starbuck, Alexander. 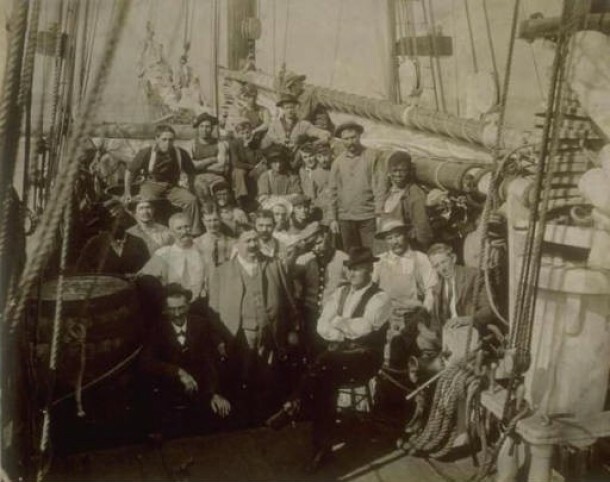 History of the American Whale Fishery from Its Earliest Inception to the Year 1876. Washington, DC: Government Printing Bureau, 1876. Link. Colby, Barnard L. New London Whaling Captains. 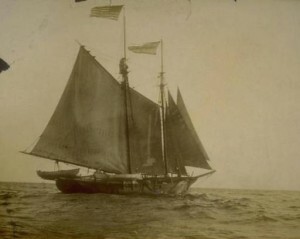 Mystic, CT: Marine Historical Association, 1936. Decker, Robert Owen. Whaling Industry of New London. York, PA: Liberty Cap Books, 1974.